I’m the first to admit that I don’t get that into Halloween. I don’t keep bins of Halloween decor in the basement and I still haven’t hung the single string of ghost lights that the kids love so much. Carving pumpkins is about as crazy as it gets. In fact, I get annoyed just thinking about the glut of candy that the kids will bring home next week. Candy that I will have to police and hide and manage its consumption. Lest you think I am some kind of Halloween Grinch, let me assure you that I let the older kids regulate their own sugar intake. They eat a few pieces a day and make it last until Thanksgiving. But Little Four has no such restraint and will inhale as much in a sitting as he can get his grubby hands on. The fallout is not pretty. However, I do enjoy getting a little crafty with Halloween costumes. Nothing too elaborate, but if we can make a costume at home in a reasonable amount of time for less than it would cost to buy one, I’m in. It’s a great opportunity for me to use my haphazard sewing skills. No need to fuss with patterns or perfect fit. The kids don’t care if seams are puckered or the hem is crooked. I hunt around for some simple instructions and then wing the rest. 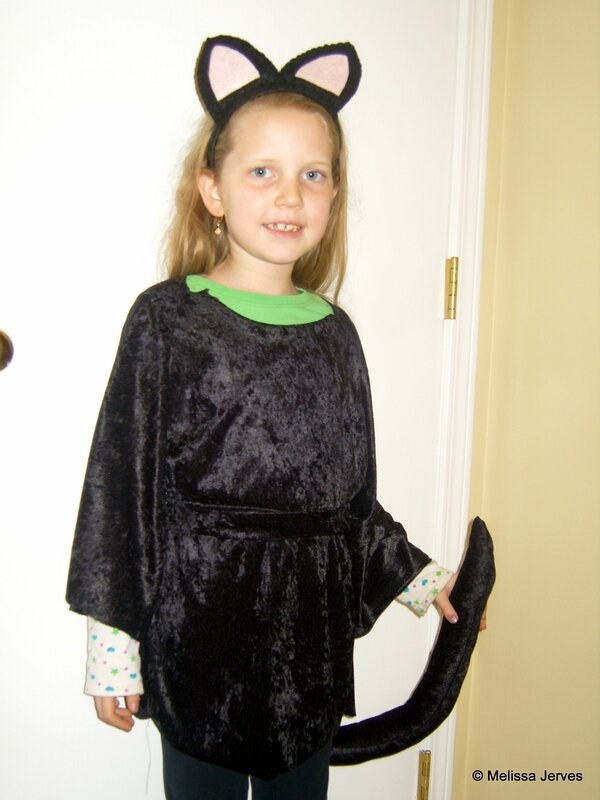 This year, Miss Seven is dressing up as a black cat. She suggested recycling the black witch’s robe that I made her last year into a tunic to wear over black leggings. Perfect–didn’t even have to buy any new material. I cut it shorter and fashioned a belt with a cat’s tail attached. I also attached some felt ears to a headband. On Halloween we’ll draw some whiskers on her face (and make sure she’s wearing a warm black sweater under her costume when she goes trick-or-treating). 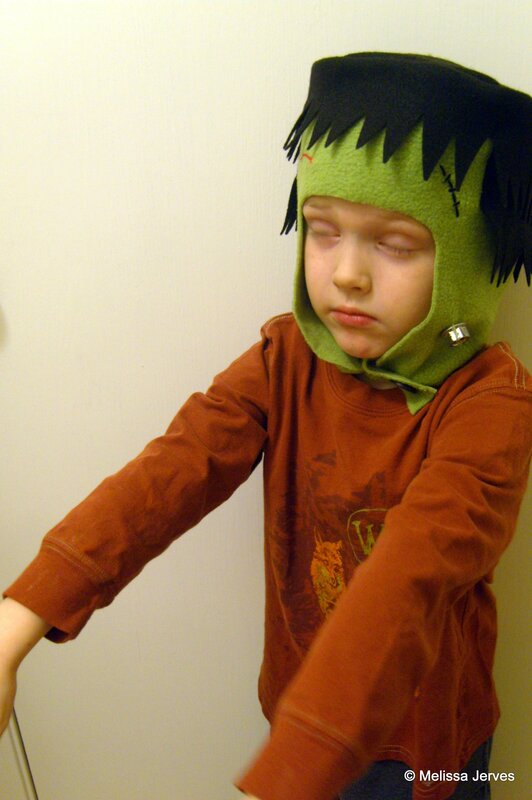 After some conversations with his grandpa, Little Four settled on Frankenstein as his costume. I found a tutorial for this wonderful Frankenstein hat, which was not difficult at all. Cheap, too–what little fabric I had to buy cost me less than $3. You could even hand stitch it if you don’t have a sewing machine. I found some spare hex nuts floating around the house, so I stitched those on instead of trying to make bolts out of fleece. As soon as I finished it, Little Four put on his Frankenstein hat and wore it through an entire piano lesson and several hours of play. We’ll add some green face paint and some ragged clothes for Halloween. He’s already mastered the monster walk. Have you gotten crafty for Halloween?